If you are planning to launch your own website quite soon, have you already designed a great landing page for it? Why do you need a landing page, you ask? Your website needs a psd landing page because this is where you will be able to make a good first impression on your site visitors and customers. This will also help you generate leads that will ultimately increase the income for your small business. Landing pages come in different forms and varieties; some of them are designed for specific roles and purposes while others can cater to the various needs of multiple websites. For example, spa landing page themes cater to the distinct needs of businesses that offer spa services while a multipurpose landing page could be used for spas, architecture sites, businesses, and more. So, to help you out, here are some of the best-looking landing page templates currently available on the web. Check them out and purchase your favorite today. 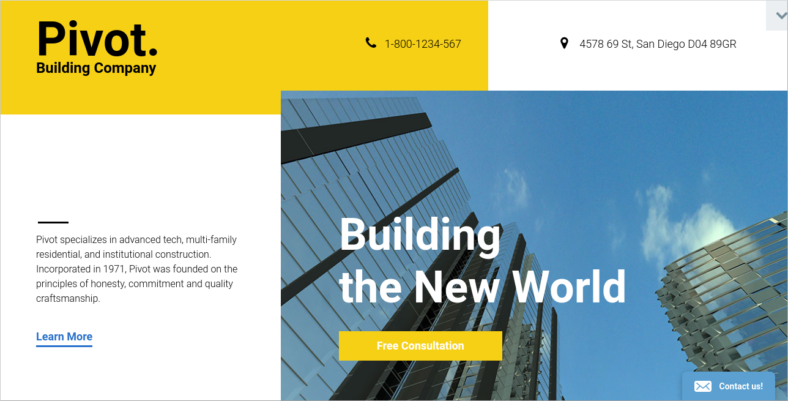 Pivot is one of the many construction website templates for landing pages that have been made readily available for individuals. It has a fully responsive design, which means it can be viewed on any type of device. The developers have also made it cross-browser compatible with major Internet browsers like Chrome, Safari, Firefox, and Opera. This is a huge advantage as it will effectively increase the reach of your site, making sure that a lot of people would be able to visit it, no matter what device or browser they are using. 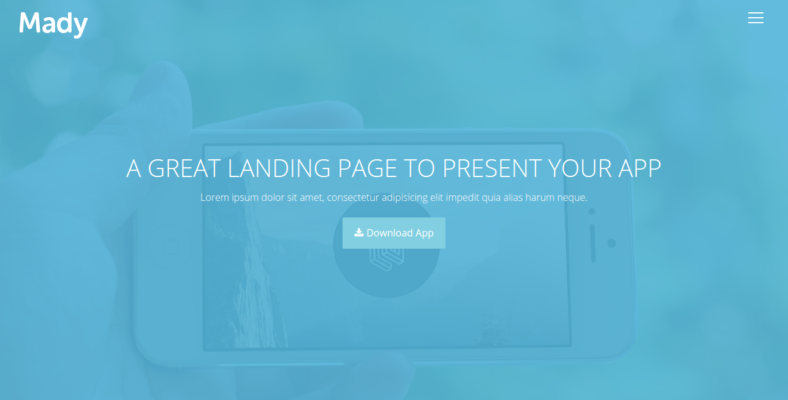 You may also see parallax landing page templates. Ecotech is an environmental template, specifically for solar panels that were created to find a way to efficiently harness the renewable energy of the sun’s radiation. 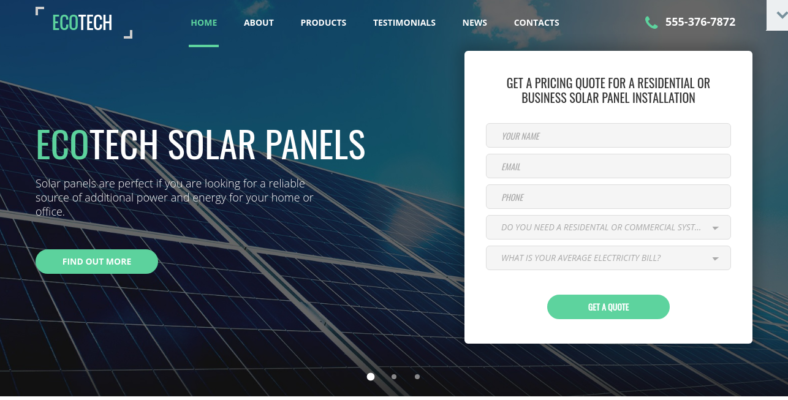 This is for websites that either promote or sell solar panel products. Its rich user interface (UI) kit will definitely amaze your site visitors and customers. In case customers would want to contact you, the web template has a built-in contact form as well. 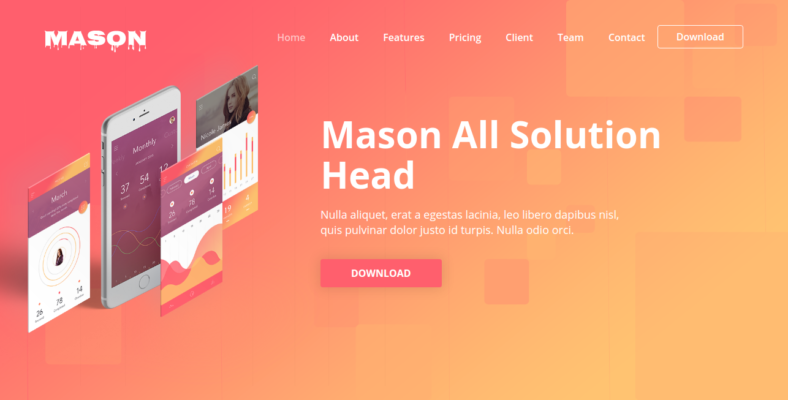 Mason is an app landing page and these kinds of landing pages differ from the usual ones a bit. They are mostly designed for mobile phones and they would let your site appear slightly distinct on smartphones, compared to when it is being viewed on desktops or laptops. The theme sports a layout design that is 100% fully responsive, along with a creative and modern flat design websites that offer lots of editing possibilities for users. You will not have to worry about your typography needs as well because it has an integration with Google Web Font. 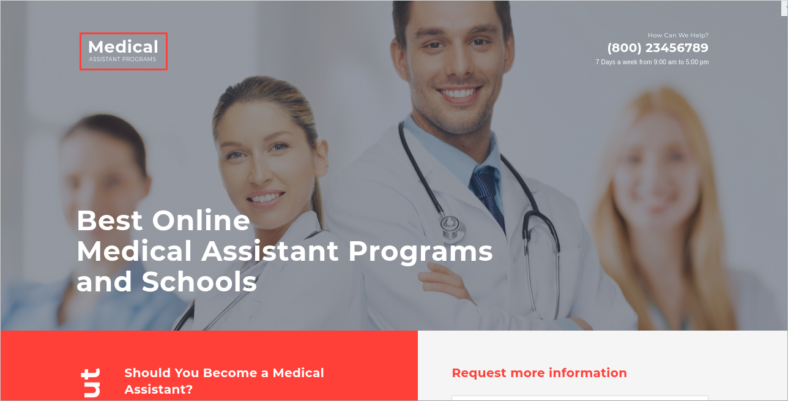 This medical template, as its name implies, is a theme for medical purposes that is meant to be used specifically as a start-up landing page. The theme is fully responsive and is accessible on any type of device, regardless if it is on a laptop, desktop, smartphone, or tablet. You certainly will not find the elegance of this template lacking because it is equipped with parallax effects, a feature that adds smooth transitions and scrolling to your site. In turn, this makes your webpage have a very fluid flow, making things appear seamless and smooth. 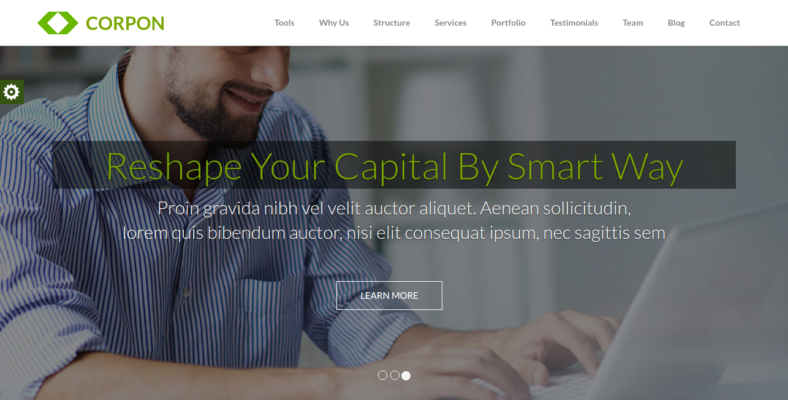 You may also see parallax scrolling website templates. 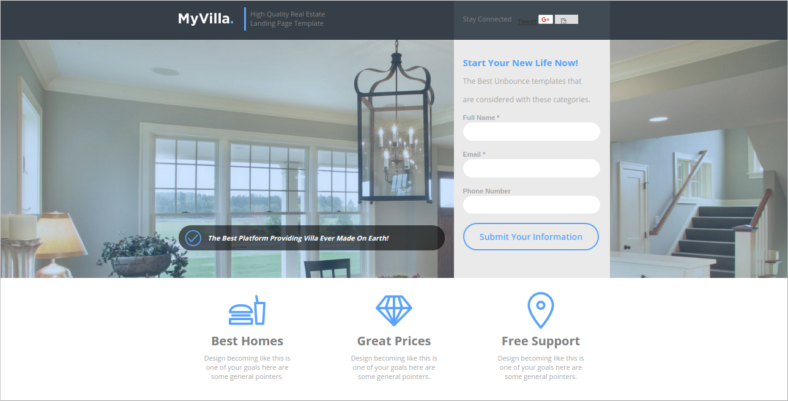 If you are looking for some real estate landing page templates, then you should definitely check My Villa out. 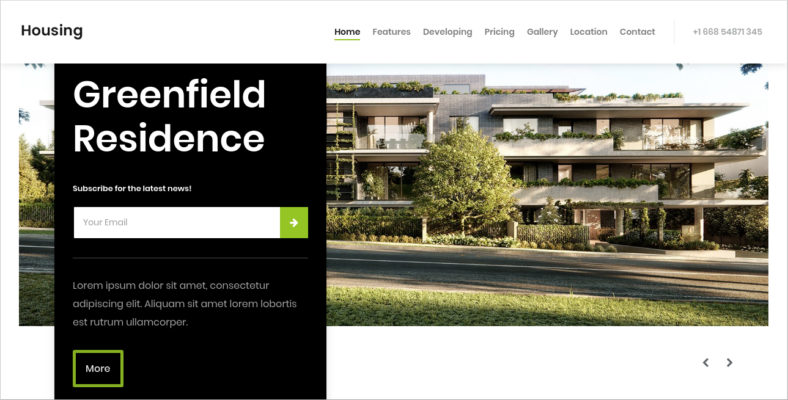 This is a theme that caters to the particular needs of real estate sites, which it does effectively, thanks to the help of the numerous features embedded within its design. It is equipped with amazing jQuery animations, truly an advantage in your arsenal that you could use to entice people to visit your site. If you like choosing your icons personally, then the template has an offer you cannot possibly decline as it features 150 free icons you can choose from while editing the landing page’s appearance. Trav will certainly take good care of your travel website and all of its needs. This landing page was created by travel agencies, travel sites, and travel businesses in mind. Its design was developed to comply with the latest marketing and design trends. It has a functioning Personal Home Page (PHP) Contact Form that is very helpful when it comes to communicating with your customers. To add a bit of flavor to your customers’ scrolling experience, the template has been embedded with a parallax scrolling effect. 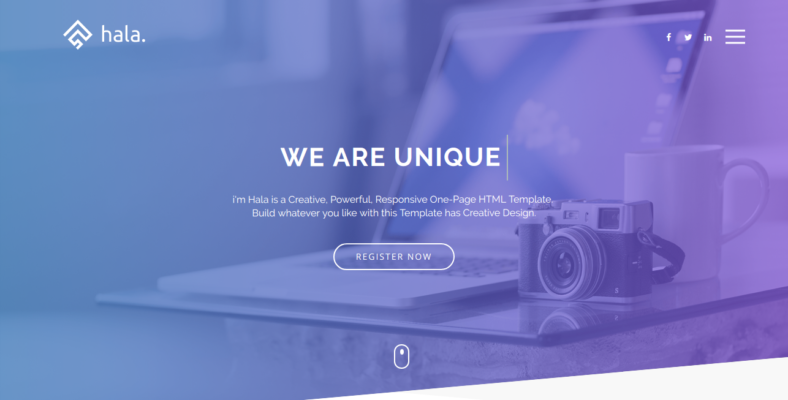 Hala is a multipurpose one-page website theme that will certainly not disappoint you with the results that it can deliver. This is made from one of the most powerful frameworks in the market, which is Bootstrap. The template runs using the Bootstrap Grid 1170px, ensuring that the editing process is well-organized and easy. 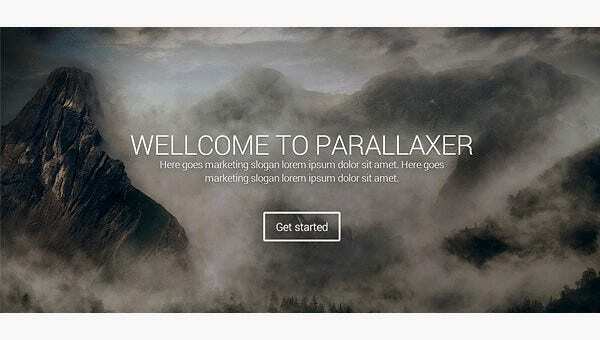 You will get to enjoy the parallax effect that this template boasts of, along with the parallax background and parallax + text rotator that it also has as features. 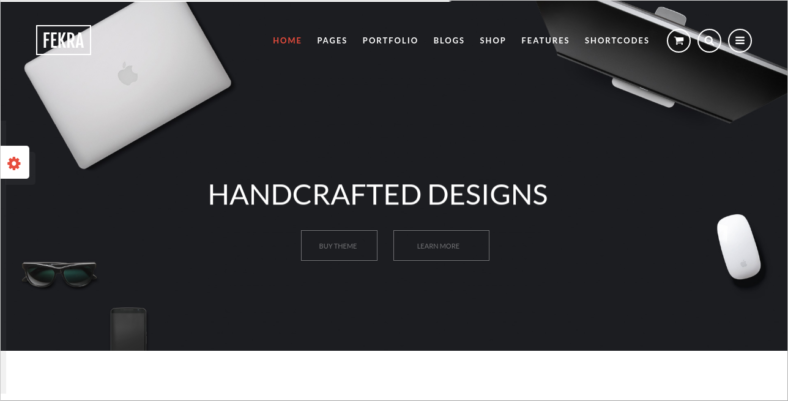 Sparks is a Bootstrap landing page template that is mainly designed for self-published authors who have decided to create their own websites. The landing page itself is very clean and simple, making it easier to be viewed on devices that do not really have powerful specifications. Its layout has two distinct designs, both of which have their own advantages. The first one is the flat design while the second one is the parallax design. Both are sure to leave your customers and site visitors stunned by their great looks. 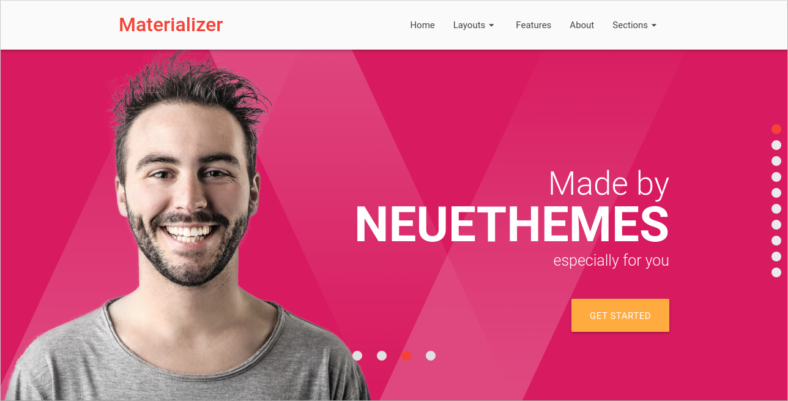 Materializer is a product landing page that mainly uses the principles and elements of Google Material Design, a design language that was created by Google in 2014. With the theme, you will be able to showcase your numerous web content using numerous block content types that you could freely choose from. The layout is 100% responsive and can be viewed on any device, a feature that is further complemented by the retina-ready function, which allows your site to adjust itself automatically to fit any screen size. 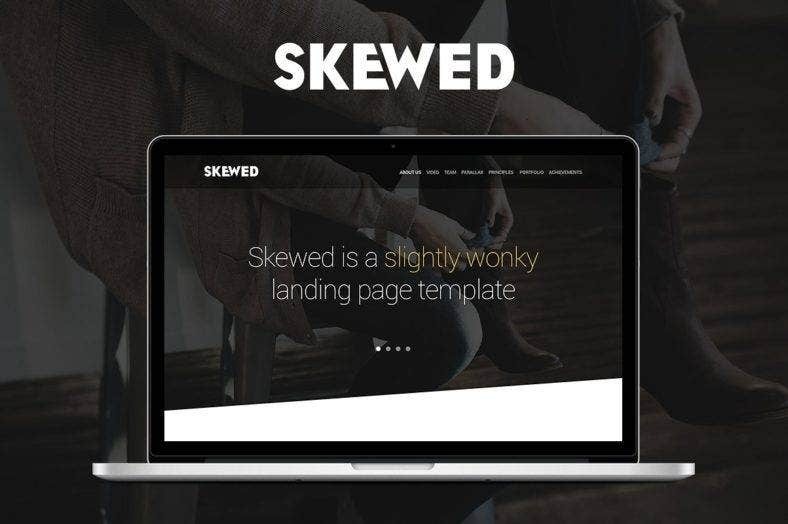 Skewed is one of the many one-page HTML templates that you would probably be stumbling upon if you searched specifically for that category. This comes as no surprise as well because this is one of the most effective themes you will come across, thanks to its many features. The template is equipped with the famous parallax effect, which is one of the features that any kind of landing page should have nowadays. It has a grid-based layout, a header that sports a full-screen slider cool background, and skewed section dividers that help form the appearance of your site. It is true that there are a lot of one-page landing page themes out in the market right now, but there will never be one like Pure. This template has a lot of features to offer, one of them being a customizable color scheme. It has two different types of background effects, namely the parallax background and crossfade background images, both of which are very appealing and easy to the eyes. You get to enjoy an unlimited grid system that is fully supported by Bootstrap 3, along with unlimited full-width portfolio layouts provided by Ajax Layout. 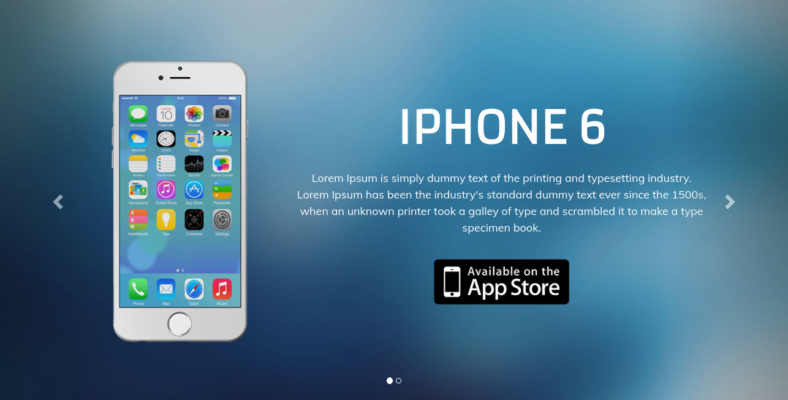 Appz is a mobile app landing page specifically designed to fit the standards of mobile phones. The template is fully responsive and mobile-friendly, capable of being accessed on tablets and smartphones. There are a total of four parallax backgrounds that you could choose from, all of which would definitely be of great help to the overall appearance of your site. Aside from that, you get to choose from two layouts, too—one that comes with a slideshow and one that does not. Most important of all, the theme can be easily customized to fit your preferences. You can tweak it easily and precisely without having to input various programming codes. 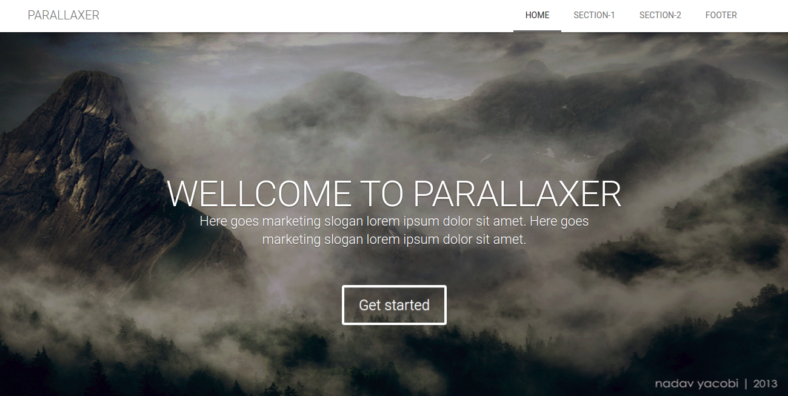 Parallaxer, as the name implies, is a Parallax template that runs on the Bootstrap framework, one of the most powerful performing frameworks available in the market. With this theme, you get to enjoy numerous parallax sections and a fully responsive catalog layout design, capable of being viewed on different kinds of devices. To further complement its responsive function, the custom scrollbar was added, a feature solely designed for mobile and tablet devices. You can also easily change the scrolling parallax effects and parallax background provided by the template and use something else of your preference. If you are looking for one of those one-page Parallax themes for business, then you definitely should not let Cleanz pass you by. 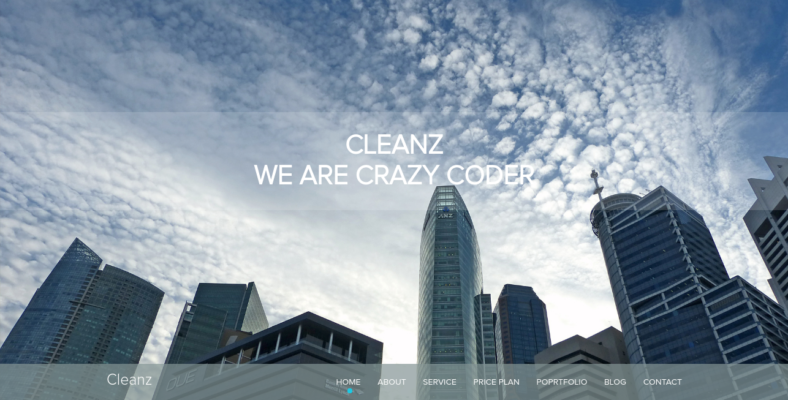 In its essence, Cleanz is a multipurpose theme for landing pages and it can be used for a personal website or business purposes. With this one, you get to have a 960 grid-based layout, which is perfect if you prefer designs that utilize 12 or 16 column styles. The template has a modern and clean design, giving it the professional vibe that you want. 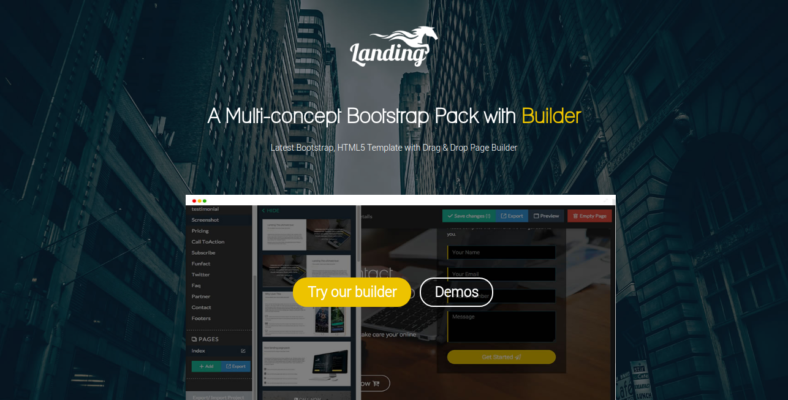 Landing is a Bootstrap template that has a very unique and powerful feature hidden up its sleeve—the drag-and-drop builder functionality. It is a functionality that allows its users to easily edit each aspect of the theme by simply dragging and dropping images for the HD background, picking out the color schemes, and more. Aside from that, you also have more than 70 reusable components in this template. There are available Parallax blocks and a working MailChimp subscription form for your customers and site visitors as well. 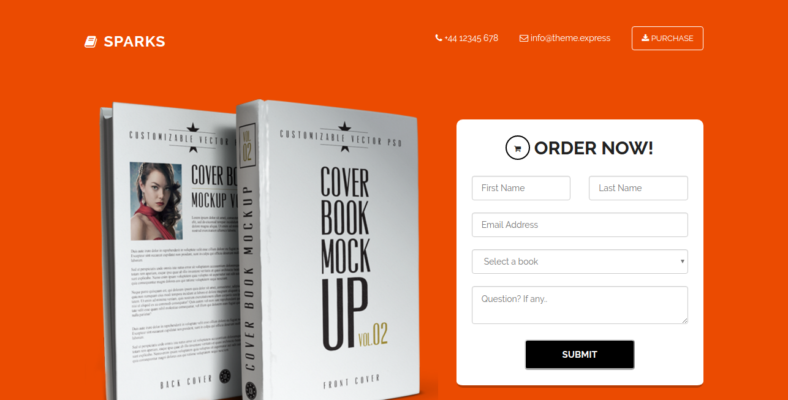 There is nothing like a creative Bootstrap theme for your landing page than Creative itself. The template is certainly true to its namesake with features like a modern and unique style, a detailed layout, a stunningly perfect pixel design, and more. It runs on the Bootstrap CSS framework and has a fully responsive design, clearly meant for the accessibility of multiple types of devices. Its W3C code has been tested and validated and so has its speed when it comes to performance. Although it is not a free landing page template, Mady is certainly worth every penny with the huge amounts of advantages and features that it has to offer. The theme has CSS3 animations embedded in its design, making its animation both powerful and reliable. There are also device Photoshop Document (PSD) files available for you to use. You can edit the files and use them to craft your preferred design, effectively increasing the level of your site’s visual appeal. It has various parallax sections, too, and it comes with more than 400 Awesome Font Icons. 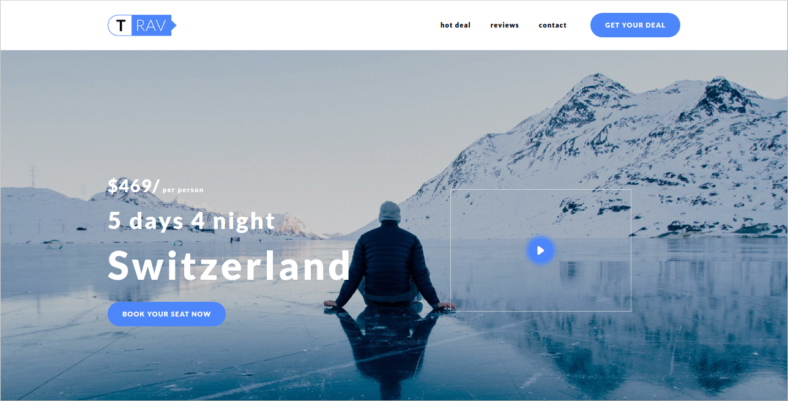 Corpon is a business template that will work perfectly as a landing page for your site, thanks to its beautiful and elegant design. It has multiple features that you can get to enjoy and take advantage of when you choose to use this theme. It has six color styles embedded in its design, making it easier for you to choose color schemes and tweak them. The parallax image effect gives your images smooth and fluid transitions, and it has cross-browser compatibility as well. You may also see Parallax Scrolling WordPress Themes & Templates. 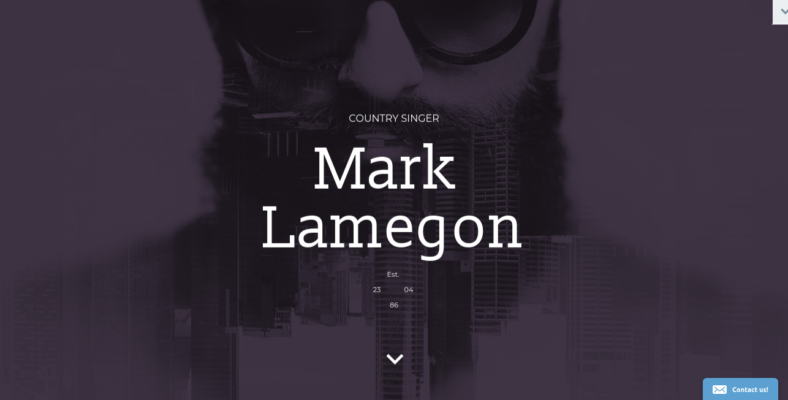 The Mark Lamegon theme is a singer website template for landing pages and it is one of the most trusted singer themes out there. The responsive web design is merely the tip of the iceberg, as it is anticipated to be able to make your site viewable on any type of device. It has a parallax effect feature as well, with the main goal of being able to present your website in the most elegant way possible. You also get to use sample newsletter subscriptions for your site, which can be useful for your customers and site visitors who want to keep up with important news about your webpage, products, or services. This one is for those who are in the industrial business who are looking for a nice oil and gas company template for their landing page. 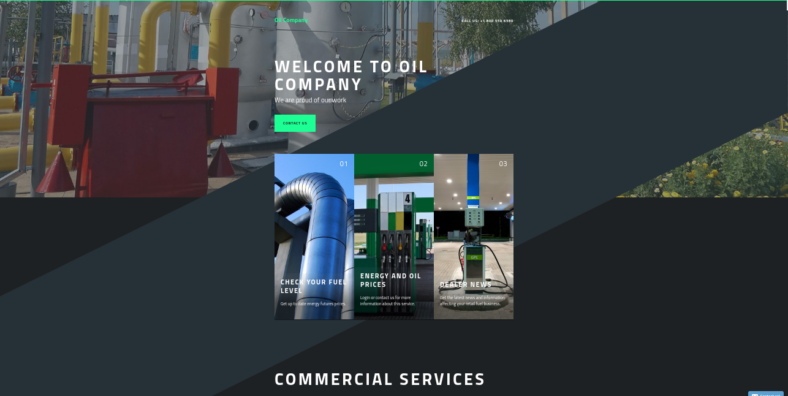 Oil Company is the perfect WP landing page theme for anyone who is in need of one for their oil and gas website. The template is focused on their customers and it shows this by providing users with an online chat support team to assist them with difficulties in real time. You also will not have to worry about any inconvenient browser compatibility issues because this one has cross-browser compatibility with major browsers like Firefox, Opera, Safari, and Chrome. 87 is one of the many responsive landing page templates that you will be able to find on this list. Since it is fully responsive, it is expected that your site will be viewable and accessible on most types of devices. It has Google Maps integration, too. Sliced PSD files are also available for you to use and edit. There are not a lot of laboratory templates for landing pages out there, so when you do find one, it is either unreliable or full of bugs. 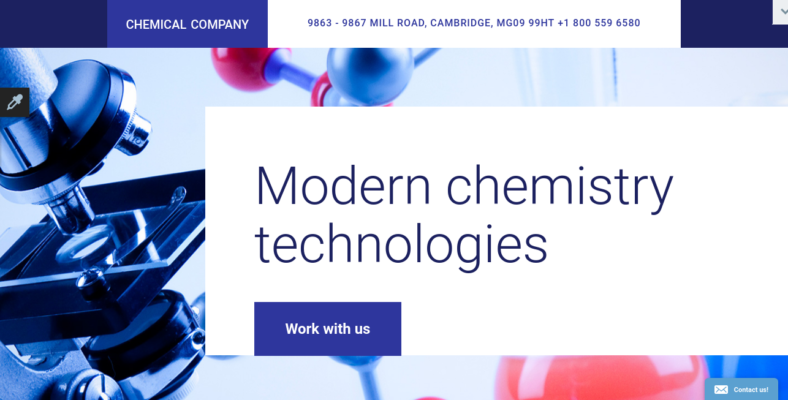 But Chemical Company is different, as it is among the few lab themes that actually provide promising results. 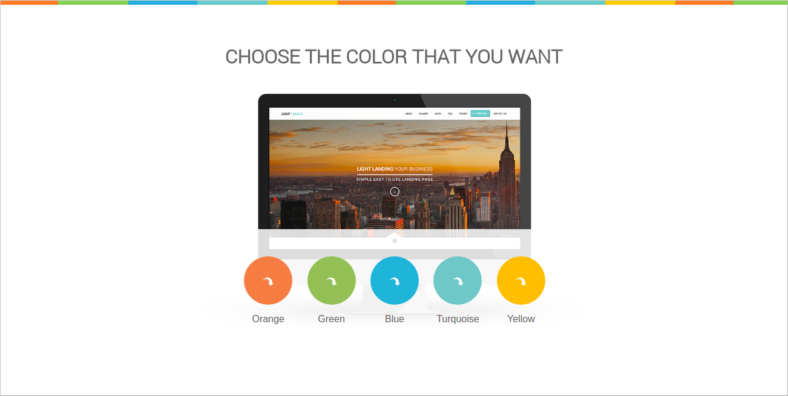 With this template, you get to use various color schemes for your site. For your typography needs, meanwhile, Google Web fonts have been made available, giving you the opportunity to fully personalize the web page down to every sample letter. Its design is 100% responsive and it comes with helpful cross-browser compatibility as well. 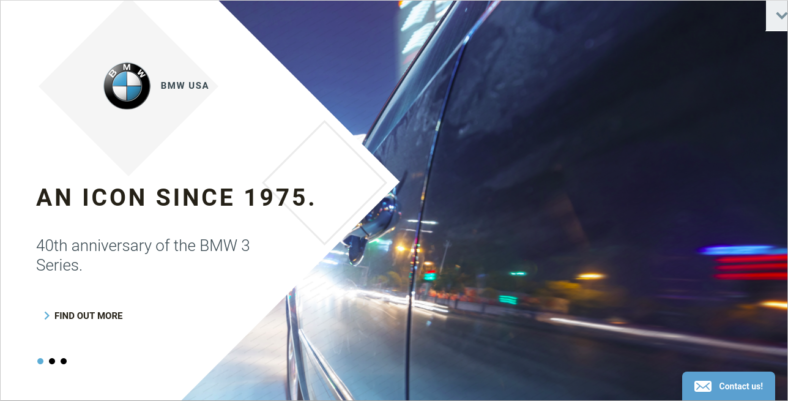 If you are in the market for a couple of car website templates, then you should definitely check this theme out and get to learn about its features. The fully responsive design will amaze both you and your customers because they would be able to access and view your site on any device at any time. Of course, the parallax effect is also present in this one because it features multiple effects for images, backgrounds, and scrolling actions. 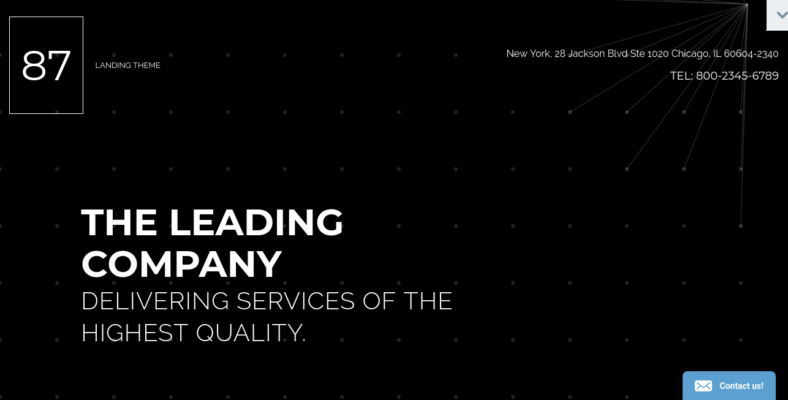 Light Landin is a multipurpose landing page that can be used for a variety of sites. However, a lot of individuals use it for their corporations, which basically makes it one of the corporate landing page templates currently available in the market. The sports theme a responsive layout that is capable of being viewed and accessed on any device. It has a retina-ready functionality as well, which greatly complements the responsive design because it lets your web page automatically adjust itself to fit any screen size. Parallax backgrounds are also available. Fekra is a one-page Drupal theme that is prepared for the Christmas season, as it already has four different Christmas versions. Aside from the Christmas-themed versions, you get to enjoy more than 300 pages, too—all of which have their unique designs that you could use for your site. The theme is fully responsive and is best WooCommerce-ready, which means you would be able to turn it into an online shopping site at any time. Housing is not a free real estate theme, but there are multiple reasons why it is so much better than the free ones and why it would be worth every penny if you purchase it. Though it was initially designed for real estate purposes, developers and architects could still use it for their sites. The template has parallax effects included as one of its many features and this will certainly make your webpage more appealing to individuals. Google Map integration is also available and it runs on the Bootstrap 4 framework. 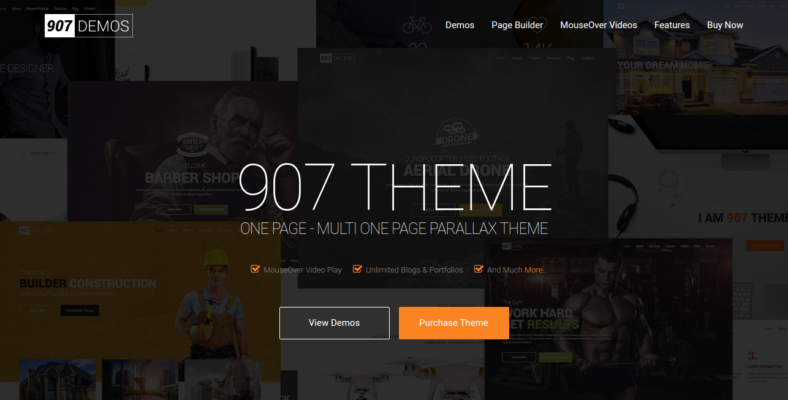 907 is one of the many landing page WordPress themes that can be used for a lot of different websites. It has a ton of features and some of them are the parallax and video backgrounds, which greatly enhance the visual quality of your site and make it more appealing to the eyes. It has a visual composer that makes the whole process of creating your site easier and hassle-free. It also comes with two different sliders, namely the Cute3D Slider and Revolution Slider. 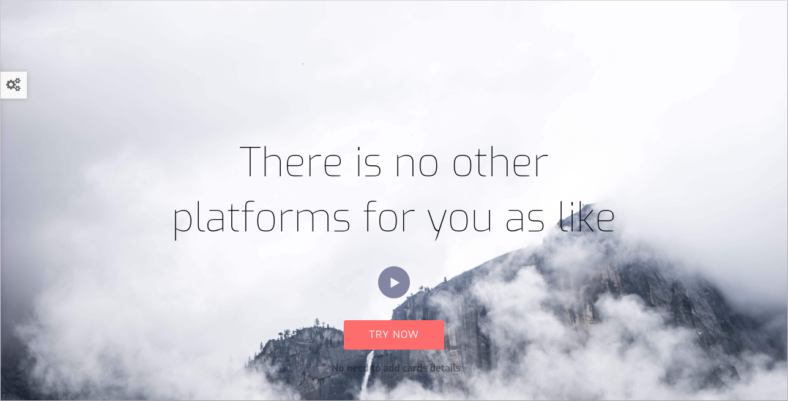 In case you are looking for a startup landing page template, then try StartEx out. 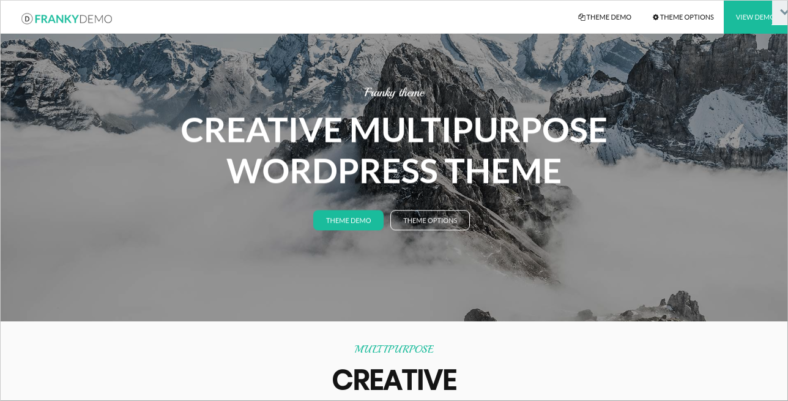 This theme was created for multiple purposes, but it would be especially ideal for startup businesses still in the early stages of creating their own sites. You get to enjoy and use image and video backgrounds, which are very important since you can use these features to attract customers and visitors. It comes in six different versions with six-layered PSD files, perfect for those who love personalizing their sites and tweaking them to fit their preferences. Now, these are just some of the many creative landing page templates that we were able to collect on and feature on this list. Check them out and try them out, as they will certainly save you the time of having to search for more. You can also add them to the many options you possibly have and try some of them out. Also, it is important to remember that a lot of options would mean that you would have a higher chance of finding a promising template. However, for you to effectively get your hands on one, you must first check the features out, whether it be for education landing page templates or hospital ones. 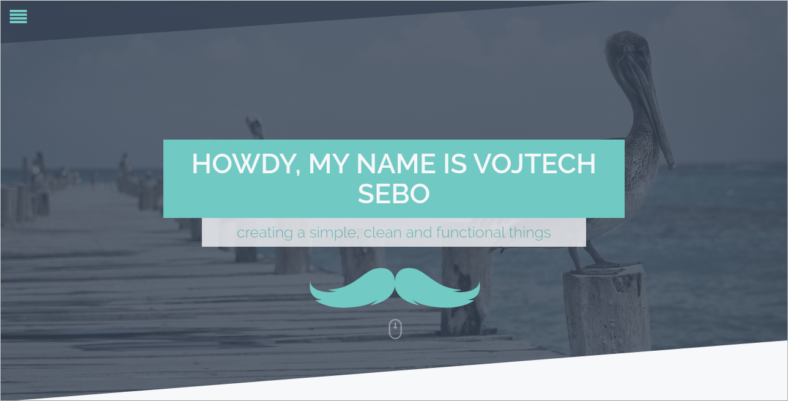 So, do not hesitate to view the demos and purchase your favorite template today!